For the font, see Toronto Subway (typeface). The Toronto subway is a rapid transit system serving Toronto and the neighbouring city of Vaughan in Ontario, Canada, operated by the Toronto Transit Commission (TTC). 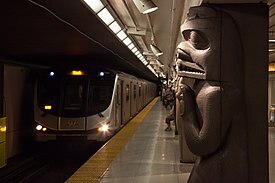 It is a multimodal rail network consisting of three heavy-capacity rail lines operating predominantly underground and one elevated medium-capacity rail line, collectively encompassing 75 stations and 76.9 kilometres (47.8 mi) of route, making it the second-longest after the Vancouver SkyTrain. In 1954, the TTC opened Canada's first underground rail line then known as the "Yonge subway", under Yonge Street between the existing Union railway station and Eglinton Avenue with 12 stations. Delivering 416 million unlinked trips in 2018, the system is Canada's busiest rapid transit system. Line 1 Yonge–University is the longest and busiest rapid transit line in the system. It opened as the Yonge subway in 1954 with a length of 7.4 kilometres (4.6 mi), and since then grew to a length of 38.8 kilometres (24.1 mi). Today, the line is U-shaped having two northern terminals looping on its southern end via Union station. Line 2 Bloor–Danforth, opened in 1966, runs parallel to Bloor Street and Danforth Avenue between Kipling station in Etobicoke and Kennedy station in Scarborough. There is a plan to extend Line 2 northeastward from Kennedy station to Scarborough Centre station. Line 3 Scarborough, originally known as the Scarborough RT (where "RT" is an abbreviation of "rapid transit"), is an elevated medium-capacity (light metro) rail line serving the city's eponymous suburban district. It opened in 1985 running from Kennedy station to McCowan station, passing Scarborough Centre. This is the only rapid transit line in Toronto to use Intermediate Capacity Transit System (ICTS) technology. There is a plan to close and dismantle Line 3 after Line 2 is extended to Scarborough Town Centre. Line 4 Sheppard opened in 2002 running under Sheppard Avenue East eastwards from Sheppard–Yonge station on Line 1 to Fairview Mall at Don Mills station; it is the shortest rapid transit line in Toronto. Line 5 Eglinton (also known as the Eglinton Crosstown) is a 19-kilometre (12 mi) light rail line under construction entirely along Eglinton Avenue, scheduled to open in 2021. The line will have 25 stations, of which 15 will be underground, while the remaining ten will be at-grade stops located in at the road's median. Line 6 Finch West (also known as the Finch West LRT) is a planned 11-kilometre (6.8 mi), 18-stop line to extend from Finch West station on Line 1 Yonge–University to the North Campus of Humber College located mainly in the median of Finch Avenue. It is scheduled for completion in 2023, with an estimated cost of $1.2 billion. Here is a list of line, extension and station openings on the Toronto subway system. March 30, 1954 The Yonge subway opened from Eglinton to Union station. It runs under or near Yonge Street, and is part of today's Line 1 Yonge–University. February 28, 1963 The "University subway" opened from Union station to St. George. This was an extension of the Yonge subway and runs under University Avenue. February 25, 1966 Line 2 Bloor–Danforth opened from Keele to Woodbine. It runs under or near Bloor Street and Danforth Avenue. May 10, 1968 Bloor–Danforth subway extensions opened west to Islington and east to Warden. March 30, 1973 A Yonge subway extension opened from Eglinton to York Mills. March 29, 1974 A further Yonge subway extension opened from York Mills to Finch. January 27, 1978 The "Spadina subway", an extension of the "University subway", opened from St. George to Wilson. This line was renamed to Yonge–University–Spadina subway. November 21, 1980 Bloor–Danforth subway extensions opened west to Kipling and east to Kennedy. March 22, 1985 Line 3 Scarborough opened from Kennedy to McCowan. June 18, 1987 North York Centre on the Yonge–University subway opened. It was constructed between two existing stations, Sheppard–Yonge and Finch. March 31, 1996 A "Spadina subway" extension opened from Wilson to Sheppard West (formerly Downsview). November 22, 2002 Line 4 Sheppard opened from Sheppard–Yonge to Don Mills. It runs under Sheppard Avenue. Excavation on Front Street for the Yonge subway, 1950. The line opened four years later, in 1954. Canada's first subway, the Yonge subway, opened in 1954 with a length of 7.4 kilometres (4.6 mi). The line ran under or parallel to Yonge Street between Eglinton Avenue and Union station. It replaced the Yonge streetcar line, Canada's first streetcar line. In 1963, the line was extended under University Avenue north to Bloor Street to connect with the Bloor–Danforth subway (opened in 1966) at the double-deck St. George station. In 1974, the line was extended from Eglinton station north to Finch station. The Spadina segment of the line was constructed north from St. George station initially to Wilson station in 1978, and in 1996 to Downsview station, renamed Sheppard West in 2017. Part of the Spadina segment runs in the median of Allen Road – an expressway formerly known as the Spadina Expressway – and crosses over Highway 401 on a bridge. Six decades of extensions gave the line a U-shaped route running from its two northern terminals (Finch and Vaughan Metropolitan Centre stations) and looping on its southern end at Union station. The latest extension from Sheppard West to Vaughan Metro Centre opened on December 17, 2017, making the line 38.8 kilometres (24.1 mi) long, over five times its original length. Opened in 1966, the Bloor–Danforth subway runs east-west under or near Bloor Street and Danforth Avenue. It replaced the Bloor streetcar line (which also served Danforth Avenue). Initially, the subway line ran between Keele station and Woodbine station. In 1968, the line was extended west to Islington station and east to Warden station, and in 1980, it was further extended west to Kipling station and east to Kennedy station. Opened in 1985, the Scarborough RT (today's Line 3) is a light metro line running from Kennedy station to McCowan station. The TTC started to construct the line to use Canadian Light Rail Vehicles. However, the provincial government forced the conversion to Intermediate Capacity Transit System technology because the province was funding the project and it owned a company that made the light metro vehicles. This line was never extended, and the current plan is to close and dismantle the line, replacing it with an extension of Line 2 to Scarborough Town Centre. Don Mills station serves as the terminus for Line 4 Sheppard, a subway line that opened in 2002. Opened in 2002, the Sheppard subway runs under Sheppard Avenue from Sheppard–Yonge station to Don Mills station. The line was under construction when a change in provincial government threatened to terminate the project. However, Mel Lastman, the last mayor of the former City of North York (today part of Toronto), used his influence to save the project. Despite the construction of many high-rise residential buildings along the line since its opening, ridership remains low resulting in a subsidy of $10 per ride. The line was intended to be extended to Scarborough Centre station, but because of the low ridership and the cost of tunneling, there is a plan to extend rapid transit eastwards from Don Mills station via a surface light rail line, the Sheppard East LRT. Metrolinx is funding the 19-kilometre (12 mi) Line 5 Eglinton (also known as the "Eglinton Crosstown"), a light rail line along Eglinton Avenue. From Mount Dennis in the west to Brentcliffe Road (east of Yonge Street), the line will run almost entirely underground where Eglinton Avenue is generally 4–5 lanes wide. However, from east of Brentcliffe Road to Kennedy station, the line will operate on the surface in a reserved median in the middle of Eglinton Avenue, where the street is at least 6 lanes wide. Building on the surface instead of tunneling reduces the cost of construction on the eastern end of the line. The average speed of the line is expected to be 28 kilometres per hour (17 mph); as a comparison, the average speed of the heavy-rail Line 2 Bloor–Danforth is 32 kilometres per hour (20 mph). The Eglinton line originated from Transit City, a plan sponsored by former Toronto mayor David Miller, to expedite transit improvement by building several light rail lines through the lower density parts of the city. Of the light rail lines proposed, only the Eglinton line is under construction as of 2018. Line 6 Finch West, also known as the "Finch West LRT", is an approved line planned to be built by Mosaic Transit Group along Finch Avenue. It is to be operated by the Toronto Transit Commission and was part of the Transit City proposal announced on March 16, 2007. The 11-kilometre (6.8 mi), 18-stop line is to extend from Finch West station on Line 1 Yonge–University to the north campus of Humber College. The line is forecast to carry about 14.6 million rides a year or 40,000 a day by 2031. It is scheduled for completion in 2023, with an estimated cost of $1.2 billion. On March 27, 1963, there was an electrical short in a subway car's motor. The driver decided to continue operating the train, despite visible smoke in the affected car, until the train reached Union station. This decision resulted in the destruction of six subway cars and extensive damage to the tunnel and signal lines west of Union station. Following this incident, safety procedures involving electrical malfunctions and/or fire in subway trains, were revised to improve safety and reduce the likelihood of a similar incident occurring. On October 15, 1976, arson caused the destruction of four subway cars and damage to Christie station, resulting in the closure of part of the Bloor–Danforth line for three days, and the bypassing of Christie station for some time afterwards for repairs. On August 11, 1995, the TTC suffered the deadliest subway accident in Canadian history, known as the Russell Hill accident, on the Yonge–University line south of St. Clair West station. Halfway between St. Clair West and Dupont stations, a southbound Line 1 subway train hit the rear of a stationary train ahead of it. Three people died and 100 other people were injured, some of them seriously. This led to a major reorganization at the TTC, with more focus on maintaining a "state of good repair" (i.e., an increased emphasis on safety and maintenance of existing TTC capital/services) and less on expansion. The heavy-rail subway lines were built in multiple segments with multiple crossovers. These are typically used for reversals at terminal stations, and allow arriving and departing trains to cross to and from the station's farside platform. They are also used for short turning trains at some through stations in order to accommodate emergency and planned service suspensions. Planned service suspensions generally occur on weekends for planned maintenance activities that are impractical to perform overnight. There is only one regular short turn service that occurs during the morning rush hour on Line 1 Yonge–University when some northbound trains short turn at Glencairn. On Line 3 Scarborough, light metro trains cannot switch directions except at the ends of the line as there are no intermediate crossovers between the two termini. Thus, there can be no short turns on Line 3. Subway doors on Lines 1 and 2 are operated by a train guard, situated in the trailing operator cab. The heavy-rail subway Lines 1 and 2 use a two-person crew, one to operate the train and another at the rear of the train to operate the doors. On October 9, 2016, Line 4 Sheppard was converted so that one person both drives the train and operates the doors. With a two-person crew, an on-board train guard is responsible for opening and closing the subway car doors, and making sure no one is trapped in a door as the train leaves a station. From the subway's inception in 1954 to 1991, the train guard notified patrons that the subway car doors were closing with two short blasts from a whistle. In a 2016 presentation, a timeline indicated Line 1 would be converted to one-person operation by 2019, and Line 2 would follow in 2021. In 1991, as a result of lawsuits, electronic chimes, using a descending three-note arpeggio (either G–E–C [C major, root position], or between one or two semitones lower (F♯–D♯–B [B major, root position] or F–D–B♭ [B♭ major, root position])) and a flashing pair of orange lights above the doorway, added for the hearing impaired, were tested and gradually introduced system-wide during the 1990s. The Toronto Rocket trains use the same door chimes and flashing orange lights as the older trains do, and also plays the additional voice announcement, "Please stand clear of the doors". Those chimes have become synonymous with the TTC and Toronto to the point that the CBC Radio One local afternoon show, Here and Now, includes them in its theme music. All staffed subway operations must verify that the train is properly berthed before the doors are opened. At each subway platform, a set of three six-inch wide platform markers are affixed onto the platform wall. The train operator and guard use them to position the train. Circular Red Disk (Lines 1, 2, and 4)—This marker is typically mounted on the station platform wall to assist the train operator in positioning the train in the station. When the operator's window is aligned with the red disk, the train is properly berthed in the station. Green Triangle (Lines 1 and 2)—This marker is typically mounted on the station platform wall to indicate to the guard, who is positioned in the trailing car, that it is safe to open the doors. When the guard's window is aligned with this marker, the guard must confirm the stop position to the operator by physically pointing to the green triangle. If the guard cannot see the green triangle, they are not permitted to open the train doors. Orange Triangle (Lines 1 and 2)—This marker is typically mounted on the station platform wall to assist the guard, who is positioned in the trailing car, to observe the platform for the required distance as the train is moving to exit the station. When the guard sees this triangle, they can cease observations. The distance between the green and orange triangles are typically the length of three rail cars. An orange circle platform marker was used to assist the train guard as the train departed the station on Line 2 prior to 2017. Circular Green Disk (Line 2)—This marker was mounted on the station platform wall in front of the guard's window in the fifth car from the lead unit. It indicated to the guard that the train was properly berthed. The guard was required to point to the circle before opening the doors to confirm the stop position. During rush hour, up to 63 trains are on Line 1 simultaneously, 40 trains on Line 2, 6 trains on Line 3, and 4 trains on Line 4. During non-rush hour periods, there are approximately 27 trains on Line 1 at any one time. On weekdays and Saturday, subway service runs from approximately 6:00 am to 1:30 am; Sunday service begins at 8:00 am. Start times on holidays may vary. The Toronto Rocket uses orange LED signs to provide visible stop announcements. On January 8, 1995, train operators began to announce each stop over the train's speaker system as a result of pressure from advocacy groups for the visually impaired. However, announcements were sporadic until the TTC began to enforce the policy circa 2005. Later, automated announcements were implemented under further pressure from the advocacy groups. All Toronto subway trains use an automated system to announce each station which is played twice over the speaker system: when the train departs a station (e.g. "The next station is: Dufferin, Dufferin station"); and when it arrives at the following station (e.g. "Arriving at: Dufferin, Dufferin station"). In addition, the TTC's new Toronto Rocket subway trains provide visible and audible automatic stop announcements. Unlike the other trains, the Rockets also announce interchange stations, such as "Change for Line 2", and terminus stations, "This is a terminal station" where applicable. As of 2015[update], they also announce, except at terminus stations, which side the train doors will open on at each stop based on direction of train travel. Switches and power rails are vulnerable to malfunction under extreme winter conditions such as heavy snow or freezing rain. During such events, the TTC runs "storm trains" overnight to keep power rails clear of ice. The TTC also has trains to apply an anti-freeze to the power rail once freezing rain starts. These precautions are also used on Line 3 Scarborough, which uses two power rails. To keep switches in the yards from freezing, crews use switch heaters and manually monitor them to ensure they stay in working order during the winter storm. Workcars are run as storm trains to prevent ice from building up on the power rails within the yards. The Toronto subway has 75 stations divided into four lines. Most stations are named for the nearest major arterial road crossed by the line in question. A few are named for major landmarks, such as shopping centres or transportation hubs, served by the station. The University Avenue section of the Yonge–University line, in particular, is named entirely for landmarks (public institutions and major churches). A terminal for TTC buses and streetcars at Main Street station. Most subway stations outside Downtown Toronto feature a terminal that connects riders to other TTC services. By December 23, 2016, Presto card readers had been installed in at least one priority subway station entrance across the TTC network. Throughout 2017 and into mid-2018, the remaining subway station entrances that still use legacy turnstiles (which were retrofitted with Presto readers between 2010 and 2015) and the "floor-to-ceiling" revolving turnstiles (found in automatic/secondary entrances, which do not have Presto readers on them) were replaced by the new Presto-equipped "glass-paddle" fare gates. A growing number of Toronto's subway stations are accessible to wheelchair users in general and riders with accessibility issues. Upgrade plans to stations call for all stations to be barrier-free and have elevator access by 2025. The May 2010 TTC cleanliness audit of subway stations found that none of them meet the transit agency's highest standard for cleanliness and general state of repair. Only 21 stations scored in the 70–80% range in the TTC's cleanliness scale, a range described as "Ordinary Tidiness", while 45 fell in the 60–70% range achieving what the commission describes as "Casual Inattentiveness". The May audit was the third in a series of comprehensive assessments that began in 2009. The commission announced a "Cleaning Blitz" that would add 30 new temporary cleaners for the latter part of 2010 to address major issues and has other action plans that include more full-time cleaners, and new and more effective ways at addressing station cleanliness. A mural at College station of the Maple Leafs, who used to play near the station. Several stations feature artworks that reflect the area's history. According to a 1991 CBC report, "aesthetics weren't really a priority" on Toronto's subway system describing stations as "a series of bathrooms without plumbing." Since that time, Toronto's subway system has had over two dozen pieces installed in various subway stations. More art appears as new stations are built and older ones are renovated. The main article (above) has a list of artwork by line and station. For example, USA Today said of the Sheppard subway line: "Despite the remarkable engineering feats of this metro, known as Sheppard Subway, [it is] the art covering walls, ceilings, and platforms of all five stations that stands out. Each station is 'a total art experience where artists have created imaginative environments, uniquely expressing themes of community, location, and heritage' through panoramic landscapes and ceramic wall murals." On December 13, 2013, Wi-Fi Internet access was launched at Bloor–Yonge and St. George stations. The ad-supported service (branded as "TConnect") is provided by BAI Canada, who have agreed to pay $25 million to the TTC over a 20-year period for the exclusive rights to provide the service. TTC/BAI Canada plan to offer TConnect at all underground stations. Commuters have to view a video advertisement to gain access to the Internet. It is expected that all of the 69 subway stations will have service by 2017, as well as the six stations along the Line 1 extension to Vaughan. From early December 2015 to late January 2016, users of TConnect were required to authenticate themselves using a Twitter account, whose Canadian operations sponsored the TConnect Wi-Fi network. Users of the network can sign in to enable an automatic Wi-Fi connection for 30 days. This arrangement was resumed on an optional basis from July 2016 to late November/early December 2016. As of August 2017[update], the Wi-Fi network is available at all existing stations, including the TYSSE stations, and will be available in all future stations. On June 17, 2015, the TTC announced that Wind Mobile (later rebranded Freedom Mobile) customers could access cellular connectivity at some TTC subway stations. BAI Canada has built a shared Wi-Fi and cellular infrastructure for the TTC that allows any wireless carrier to sign on and provide underground cellular service to their customers. Wind, as the launch carrier, had a one-year period of exclusivity, which expired in June 2016. Since July 1, 2016, the shared cellular DAS had been open for other carriers to join. Cellular services are available at 28 stations with service at additional stations having been added in December 2016, including the stations in the extension to Vaughan Metropolitan Centre station. The tunnels from St. Patrick station to Bloor–Yonge station also have cellular service. Rosedale station bears the name of the neighbourhood (Rosedale) in which it is located. The TTC considers multiple different factors when they name stations and stops for subway and LRT stations. They consider local landmarks, the cross streets of the station, distinct communities of the past and present in the vicinity of the station, names of other stations in the system, and the grade of the station. Metrolinx also uses the word "stop" in place of "station" at 10 of the 25 stations along Line 5, particularly those that are not grade-separated. ^ 456 vehicles ordered for 6-car TR trainsets, 444 delivered as of January 2017. ^ 24 vehicles ordered for 4-car TR trainsets, 16 delivered as of January 2017. ^ 4-car TR train capacity prorated from the capacity of the 6-car TR train. ^ Metrolinx plans to use the Flexity Freedom for Line 5 but has ordered the Citadis Spirit as backup. ^ Planned fleet size for Line 5 assuming Flexity Freedom is used. The Toronto Rocket is the newest subway train used by the TTC. Lines 1, 2 and 4 use two types of vehicles: the new Toronto Rocket (TR) trains on Line 1 Yonge–University and Line 4 Sheppard, and the T1 trains on Line 2 Bloor–Danforth. Because of shorter station platforms, Line 4 uses 4-car TR trains. The TTC's original G-series cars were manufactured by the Gloucester Railway Carriage and Wagon Company. All subsequent heavy-rail subway cars were manufactured by Bombardier Transportation or one of its predecessors (Montreal Locomotive Works, Hawker Siddeley, and UTDC). All cars starting with the Hawker Siddeley H series in 1965 have been built in Bombardier's Thunder Bay, Ontario plant. The final H4 subway cars were retired on January 27, 2012. The last H5 subway service run took place on June 14, 2013 and the H6s were retired the following year, with the final run on June 20, 2014. Following the introduction of the Toronto Rockets on Lines 1 and 4, all the T1 trains have been moved to Line 2. The T1s have a life expectancy of up to 2026, during which time the T1s would be replaced with Toronto Rockets, which have a 30-year life expectancy. An S-series train leaving Kennedy station. The S series is used exclusively on Line 3 Scarborough. The train is photographed in its original livery. Line 3 Scarborough uses 28 S-series trains built by the Urban Transportation Development Corporation (UTDC) in Millhaven, Ontario. These Intermediate Capacity Transit System (ICTS) trains are Mark I models, similar in design to the original trains found on the Vancouver SkyTrain. These are the original vehicles of the Scarborough RT and have been in service since the line's opening in 1985. Because of the trains' age, they have been refurbished for operation until the extension of Line 2 Bloor–Danforth is built. Metrolinx plans to use 76 Bombardier Flexity Freedom low-floor, light-rail vehicles for Line 5 Eglinton; however, 44 Alstom Citadis Spirit vehicles may be used if Bombardier is unable to deliver the Flexity Freedom on time. Such a substitution would require modifications to Line 5, especially the maintenance facility, as the Citadis Spirit is longer than the Flexity Freedom. Metrolinx intends to use 17 Citadis Spirit vehicles on the planned Line 6 Finch West instead of the Flexity Freedom. The heavy rail and light metro lines have some characteristics in common: Such lines are fully isolated from road traffic and pedestrians; the station platforms are covered, and the trains are boarded through many doors from high platforms within a fare-paid zone separated by faregates. In contrast, the surface portions of the light rail (Line 5) will fit into the street environment. Light-rail tracks will be laid on the surface within reserved lanes in the middle of the street, and cross street intersections at grade. Surface stations will have simple, low-level platforms. However, like heavy rail and light metro, passengers will be able to board light rail trains by multiple doors. Fixed block signalling has been used throughout the subway system since the opening of Toronto's first subway in 1954. As of December 2018[update], fixed block signalling is used on most of Line 1 and on the full length of lines 2 and 4. Along with automatic signalling, used to prevent rear-end train collisions, interlocking signals are used to prevent collisions from conflicting movements on track crossovers. In 2009, the TTC awarded a contract to Alstom to upgrade the signalling system of the existing section of Line 1, as well as equip its extension into Vaughan, with moving block-based communications-based train control (CBTC) by 2012. This automatic train control (ATC) project will cost $562 million, $424 million of which is funded by Metrolinx. With ATC, the TTC will be able to reduce the headway between trains from 2.5 minutes to 2 minutes during rush hours, and allow a 25 percent increase in the number of trains operating on Line 1. Deadlines for the complete conversion of Line 1 were pushed back to 2016 and again to 2018. The first section of the "Urbalis 400" ATC system on Line 1 entered revenue service on December 17, 2017, between Sheppard West to Vaughan Stations in conjunction with the opening of the TYSSE project. In December 2018, ATC operation was extended south from Sheppard West to Dupont, and was planned to be cover the whole line by 2019. However by December it was revealed that ATC conversion will not be complete by 2019. ATC is now scheduled to be fully deployed in phases on the remainder of Line 1 by 2022. The TTC then plans to convert Line 2 to ATC by 2030 subject to the availability of funding. Blocking those attempting suicide or trespassers from the tracks: it takes 70 to 90 minutes to resume operations each time there is a personal injury at track level. Eliminating fires from debris falling on the tracks and the third rail. Allowing trains to enter crowded stations at speed, thus speeding up service along the line. Line 3 Scarborough has been equipped with automatic train control from the outset, using the same SelTrac IS system as Vancouver's SkyTrain, meaning it could be operated autonomously. However, for safety, each train has an operator on board who monitors the doors. When completed, Line 5 Eglinton will use Bombardier Transportation's Cityflo 650 CBTC automatic train control on the underground section of the line between Laird station and Mount Dennis station, along with the Eglinton Maintenance and Storage Facility (under construction) adjacent to Mount Dennis station. Subway tracks in Toronto were built to 4 ft 10 7⁄8 in (1,495 mm), the same gauge used by the TTC's streetcar system. The subway system (lines 1, 2 and 4) is built to the Toronto gauge of 4 ft 10 7⁄8 in (1,495 mm), which is the same gauge used on the Toronto streetcar system. This gauge is 2 3⁄8 in (60 mm) wider than the usual 4 ft 8 1⁄2 in (1,435 mm) standard gauge. Some early subway proposals involved using streetcars at least partially in tunnels, so using same gauge would be advantageous, but the idea was ultimately dropped in favour of dedicated rapid transit trains. A number of ex-streetcar vehicles were used as work trains for the subway, taking advantage of the common gauge. Indeed, before the opening of the Yonge subway in 1954, there was a temporary interchange track between the Yonge streetcar line and the Davisville Yard on the north side of the Belt Line bridge. However, according to rail historians John F. Bromley and Jack May, the reason that the Yonge subway was built to the streetcar gauge, was that between 1954 and 1965, subway bogies were maintained at the Hillcrest Complex where the streetcar gauge is used for shop tracks. The Davisville Carhouse was not equipped to perform such heavy maintenance, and the bogies would be loaded onto a specially built track trailer for shipment between Davisville and Hillcrest. Line 3 Scarborough uses standard-gauge tracks, as the ICTS design for the line did not allow for interchanging of rail equipment between the subway system and Line 3. When its ICTS vehicles need anything more than basic service (which can be carried out at the McCowan Yard), they are carried by truck to the Greenwood Subway Yard. The Line 5 Eglinton and Line 6 Finch West LRT lines will be constructed to 1,435 mm (4 ft 8 1⁄2 in) standard gauge. The projects are receiving a large part of their funding from the Ontario provincial transit authority Metrolinx and, to ensure a better price for purchasing vehicles, it wants to have a degree of commonality with other similar projects within Ontario. The subway system has the following yards to provide storage, maintenance and cleaning for rolling stock. Emergency alarms (formerly "Passenger assistance alarms"): Located throughout all subway and RT trains — When the yellow strip is pressed, an audible alarm is activated within the car, a notification is sent to the train crew and the Transit Control Centre, which in turn dispatches a tiered response. An orange light is activated on the outside of the car with the alarm for emergency personnel to see where the problem is. Emergency power cut devices: Marked by a blue light, located at both ends of each subway and RT platform — For use to cut DC traction power in the event a person falls or is observed at track level or any emergency where train movement into the station would be dangerous. These devices cut power in both directions for approximately one station each way. Public telephones: Located in various locations in all stations, and at the Designated Waiting Area's on each subway platform. Emergency calls can be made to 911 toll free. Phones located at the DWA's also include a "Crisis Link" button that connect callers – free of charge – to a 24-hour crisis line in the event that they are contemplating self-harm. Subway operators begin their training at Hillcrest with a virtual reality mockup of a Toronto Rocket car. The simulator consists of the operator cab with full functions, a door and partial interior of a subway car. The simulator is housed in a simulated subway tunnel. Construction of a new subway training centre is underway at the Wilson Complex, as part of the Toronto Rocket subway car programme. Line 5 Eglinton is a light rail line under construction along Eglinton Avenue that will operate underground and at-grade between Kennedy and the future Mount Dennis station. It is planned to have 25 stations; 15 of these will be underground while the remaining ten will be at-grade stops accessed at the road's median. Its planned opening is in 2021. Line 6 Finch West is a planned light rail line that will run west from the Finch West subway station to Humber College in north Etobicoke. It will be 11 kilometres (6.8 mi) long with 18 surface stations and one underground connection to Line 1 Yonge–University at Finch West station. Work to relocate utilities started in 2016; the expected completion is in 2023. The Scarborough Subway Extension (SSE) is a proposal to replace Line 3 Scarborough with an eastward extension of Line 2 Bloor–Danforth. On October 8, 2013, Toronto City Council conducted a debate on whether to replace Line 3 Scarborough with a light rail line or a subway extension. In 2014, the city council voted to extend Line 2 Bloor–Danforth to Scarborough City Centre, which will eventually lead to the closure of Line 3. The SSE will be 6 kilometres (3.7 mi) long and add one new station to Line 2 at Scarborough Town Centre. TTC and city staff finalized the precise route of the SSE in early 2017. The proposed completion deadline for the project is 2026. The Sheppard East LRT is a proposed light rail line that will run east from Don Mills station to Morningside Avenue in Scarborough. The line would be 13 kilometres (8.1 mi) long with 25 surface stations and one underground connection at Don Mills station on Line 4 Sheppard. Construction of the Sheppard East LRT was to start upon completion of Line 6 Finch West. However, in July 2016, the Toronto Star reported the Sheppard LRT had been deferred indefinitely. Despite this, the Sheppard East LRT is included in the 2018–2022 TTC Corporate Plan and tentatively referred to as Line 7. The Relief Line is a proposed heavy-rail subway line running from Pape station south to Queen Street East and then west to the vicinity of Toronto City Hall. The proposal includes intermediate stations at Sherbourne Street, Sumach Street, Broadview Avenue, and another near Gerrard Square. As of January 2016, alignment options and possible stations were still being studied, and the project is unfunded. Construction would take about 10 years to complete. As early as 2008, Metrolinx chair Rob MacIsaac expressed the intent of constructing the Relief Line to prevent overcrowding along Line 1. Toronto City Council also expressed support for this plan. The Yonge North Subway Extension (YNSE) is a proposal to extend Line 1 Yonge–University north along Yonge Street from Finch station, the existing terminus of Line 1, to Richmond Hill. There would be new stations at Drewry/Cummer, Steeles Avenue, Clark Avenue, Royal Orchard Boulevard, Langstaff Road and the existing Richmond Hill Centre Terminal at Highway 7. The province's MoveOntario 2020 plan proposed this extension. The main problem with this proposal is that Line 1 is at capacity, and the TTC says that the Relief Line and SmartTrack must both be in service before opening the YNSE. The Jane LRT is a proposed LRT line that would begin at Jane station on Line 2 and proceed north to Pioneer Village station on Line 1. While initially part of the cancelled Transit City plan, the Jane LRT is part of the 2018–2022 TTC Corporate Plan and tentatively referred to as Line 8. The Queen subway line was a proposed subway line that would have been the city's second subway line. A roughed in station was built under Queen station. The route for the subway line is included in the proposed route for the Relief Line. The Eglinton West line was a proposed subway line in the late 1980s and early 1990s. It was cancelled with the election of Mike Harris. Much of its route is included in Line 5 Eglinton. The Don Mills LRT was a proposed LRT line that would have headed north from Pape station along Don Mills to Don Mills station. Its route has since been incorporated into the northern half of the Relief Line. The Scarborough Malvern LRT was a proposed LRT line from Kennedy station east to the University of Toronto Scarborough. Its route has since been incorporated into a future expansion for Line 5. ^ a b c d "2013 TTC Operating Statistics". Toronto Transit Commission. Retrieved 2015-01-14. ^ a b c "Toronto-York Spadina Subway Extension". Ttc.ca. Retrieved 2017-02-08. ^ a b c "Public Transportation Ridership Report – Fourth Quarter, 2018" (PDF). American Public Transportation Association. April 12, 2019. p. 37. Retrieved 2019-04-19. ^ a b c "Service Summary January 6 to March 30, 2013" (PDF). Toronto Transit Commission. December 13, 2012. Retrieved 2013-02-10. ^ "Eglinton Crosstown LRT". Metrolinx.com. Retrieved 2018-01-28. ^ "Scarborough Subway Extension – Initial Business Case" (PDF). City of Toronto. June 2016. p. 1. Retrieved 2017-02-28. ^ "TTC Subway". ttc.ca. Retrieved 2017-12-26. ^ "Traffic authorities from all over world see subway opened", Toronto Daily Star, March 30, 1954, p. 3. ^ a b c Bow, James (December 28, 2016). "The Scarborough Rapid Transit Line". Transit Toronto. Retrieved 2017-01-13. ^ Adel, Aaron; Bow, James (October 23, 2016). "The Sheppard Subway". Transit Toronto. Retrieved 2017-01-13. ^ Kalinowski, Tess (September 24, 2015). "Eglinton Crosstown to open a year later than expected". Toronto Star. Retrieved 2015-09-24. ^ a b c d e f g h i j k "2013 TTC Operating Statistics". Toronto Transit Commission. Retrieved 2017-01-27. ^ Byford, Andy (March 26, 2015). "Toronto-York Spadina Subway Extension – Schedule and Budget Change" (PDF). Toronto Transit Commission. Retrieved 2017-04-15. ^ "Aecon consortium selected as preferred proponent for the Finch West Light Rail Transit project in Toronto". AECON. Retrieved July 1, 2018. ^ "For a Greater Region – Finch West LRT". Metrolinx. Retrieved July 1, 2018. ^ Pelley, Lauren. "20 years after Russell Hill, Toronto's deadliest subway crash". Toronto Star. Retrieved 2019-04-23. ^ "Ten Years After - Toronto Star". Transit Toronto. August 6, 2005. Retrieved 2018-10-26. ^ Byford, Andy (January 20, 2017). "Necessity of TTC subway closures explained". Toronto Transit Commission. Retrieved 2017-01-23. The new signal system will be introduced in phases from this fall and will be completed by the end of 2019 at which point we will undertake similar work on Line 2. ^ Monro, Steve (October 23, 2017). "TTC Service Changes Effective Sunday, November 26, 2017". Retrieved November 14, 2018. ^ "Rocket Talk: What Are Those Subway Symbols For? | news". Torontoist. August 26, 2010. Retrieved 2012-11-07. ^ "TTC union rep blames policy change for worker assault". OHS Canada Magazine. 2017-03-28. Retrieved 2019-04-14. ^ "TTC subway guards pointing at the wall. Why? Some don't know | Globalnews.ca". globalnews.ca. 2015-02-20. Retrieved 2019-04-14. ^ "Ontario Transit Services Expected To Announce All Transit Stops". Ontario Human Rights Commission. October 15, 2007. Archived from the original on 2009-08-15. Retrieved 2008-03-01. ^ a b Ku, Christina (June 3, 2007). "Our lady of the stations: Meet the calm-voiced woman behind the TTC's automated subway announcements". Toronto Star. Retrieved 2007-07-18. ^ a b "Service changes in the event of an ice storm". Toronto Transit Commission. April 16, 2018. Archived from the original on 2018-04-16. Retrieved 2018-04-16. ^ Wilson, Codi (December 22, 2016). "TTC has now rolled out PRESTO at every subway station". CP24 News. Bell Media. Retrieved 2017-01-29. ^ "No TTC stations meet cleanliness standard". CBC. July 12, 2010. Retrieved 2014-07-24. ^ "Subway Station Appearance Improvement Update" (PDF). Toronto Transit Commission. July 14, 2010. Retrieved 2012-03-31. ^ Sell, Shawn (September 2, 2004). "10 great places to stop for subway art". USA Today. ^ "TTC, BAI Canada launch free WiFi at two subway stations". Ttc.ca. Retrieved 2018-05-27. ^ Reserved., . All Rights (26 November 2013). "Two Toronto subway stations now have free Wi-Fi". O.canada.com. Retrieved 2018-05-27. ^ "Wi-fi Now Available At". TCONNECT. Archived from the original on 2015-02-20. Retrieved 2015-01-07. Each of the 65 underground stations will have wireless and Wi-Fi service by 2017. ^ "Wi-Fi expands to four more TTC subway stations". ttc.ca. Retrieved 2018-05-27. ^ "Wi-Fi In Our Stations". Ttc.ca. Retrieved 2018-05-27. ^ "TTC, BAI Canada & WIND Mobile launch cellular service underground". ttc.ca. Retrieved 2018-05-27. ^ "Transit Coverage". freedommobile.ca. Freedom Mobile. ^ "Eglinton Line Station Names Combined Report" (PDF). Toronto Transit Commission. November 23, 2015. Retrieved July 2, 2018. ^ "Stop Naming Finch West LRT". Metrolinx Engage. Metrolinx. Retrieved July 2, 2018. ^ "Stations and Stops". Eglinton Crosstown. Metrolinx. Retrieved July 2, 2018. ^ a b c d e "Service Summary" (PDF). Toronto Transit Commission. January 8, 2017. Retrieved 2017-01-21. ^ a b c d e f "2013 TTC Operating Statistics". Toronto Transit Commission. December 31, 2013. Retrieved 2017-01-17. ^ a b "Sheppard subway line gets new Toronto Rocket trains". Canadian Broadcasting Corporation. May 30, 2016. Retrieved 2017-01-15. ^ a b Spurr, Ben (July 20, 2016). "Metrolinx threatens legal action over late delivery of light rail vehicles". Toronto Star. Retrieved 2016-07-20. ^ a b "Crosstown Infographic". Metrolinx. Retrieved 2017-01-17. ^ a b "Metrolinx to buy vehicles from Bombardier competitor as backup plan for Eglinton Crosstown". CBC News. CBC. Retrieved July 1, 2018. ^ "Citidis Spirit Light Rail Vehicle". Metrolinx. Retrieved July 1, 2018. ^ Kalinowski, Tess (March 4, 2011). "So what happened to those TTC improvements?". Toronto Star. Retrieved 2012-03-31. ^ Tapper, Josh (January 27, 2012). "Long-running subway car takes final journey". Toronto Star. Retrieved 2012-03-31. ^ "Toronto Rocket unveiled". www.ttc.ca. Retrieved 2019-04-14. ^ a b Spurr, Ben (May 13, 2017). "How do TTC's streetcar options compare? It's Bombardier versus Alstom". Toronto Star. Retrieved 2017-05-13. ^ "Stations and Stops". Metrolinx. Retrieved 2017-01-27. ^ "Request for Information (RFI) For Rail Milling Services RFI No. R31CA15135" (PDF). Toronto Transit Commission. April 28, 2015. Retrieved 2017-06-08. ^ a b c Kalinowski, Tess (November 20, 2014). "TTC signal solution promises subway relief someday — but for now, it's more delays". Toronto Star. Retrieved 2015-11-29. ^ Royson, James (February 8, 2014). "Driverless Toronto needs driverless trains: James". Toronto Star. Retrieved 2015-11-29. ^ Vantuono, William (5 May 2009). "Alstom lands CBTC contract in Toronto". RailwayAge. Simmons-Boardman Publishing Inc. Retrieved 8 December 2018. ^ "Alstom's signalling system equips Toronto subway extension" (Press release). Alstom. 18 December 2017. Retrieved 8 December 2018. ^ "How the TTC's subway auto-pilot will streamline your commute". Retrieved 2019-04-10. ^ "TTC will not complete subway signal-system upgrade by 2019 deadline". Retrieved 2019-04-10. ^ Fox, Chris (2019-04-05). "New signal system is three years behind schedule and $98M over budget: report". CP24. Retrieved 2019-04-10. ^ Spurr, Ben (November 6, 2017). "TTC test of new signalling system 'exceeded expectations'". Toronto Star. Retrieved 2017-11-08. ^ Spurr, Ben (June 19, 2018). "Subway death renews calls for TTC to install platforms barriers". Toronto Star. Retrieved June 19, 2018. ^ Munro, Steve (June 17, 2013). "Metrolinx Announces Design Changes and Public Meetings on Eglinton LRT (Update 8)". Steve Munro. Archived from the original on 2015-03-04. Retrieved 2013-06-17. Metrolinx intends to use automatic train control on the underground section of Eglinton, and the yard access will be part of the ATC territory. ^ a b "Frequently Asked Questions About Toronto's Streetcars". Transit Toronto. Retrieved 2014-05-04. ^ Baldwin Collection (1953). "Yonge St. looking n. from G.T.R. Belt Line bridge s. of Merton St". Toronto Public Library. Retrieved 2016-09-21. ^ Adel, Aaron; Bow, James (June 25, 2015). "The Greenwood Subway Yards". Transit Toronto. Retrieved 2016-12-13. ^ "Transit City measures up to international standard". Toronto Star. January 6, 2010. Retrieved 2014-10-04. ^ "Keele Yard reopens to operation" (PDF). Toronto Transit Commission. May 24, 2017. Retrieved 2018-05-30. ^ a b c "Security features". Toronto Transit Commission. Archived from the original on 2011-10-17. ^ a b "What to do in an emergency". Toronto Transit Commission. Archived from the original on 2011-02-17. ^ "TTC and Toronto EMS place more paramedics in Toronto's subway system". Toronto Transit Commission. March 20, 2009. Retrieved 2012-03-31. ^ "Procurement Authorization – Wilson Carhouse Expansion – Toronto Rocket – Contract C1-34" (PDF). Toronto Transit Commission. July 10, 2008. Retrieved 2012-03-31. ^ a b Fox, Chris (2015-04-27). "Construction on Finch West LRT to begin in 2016 but Sheppard East LRT on hold". CP24. Retrieved 2015-04-27. ^ "Toronto Transit Commission Report No. ?? – Scarborough_Subway_Extension_Update" (PDF). Toronto Transit Commission. June 24, 2014. p. 1. Retrieved 2014-10-30. ^ "A Scarborough Subway: Do the Numbers Add Up?". The Globe and Mail. July 4, 2014. p. 1. Retrieved 2014-11-05. ^ Spurr, Ben (January 11, 2017). "Scarborough subway report delayed . . . again". Toronto Star. Retrieved 2017-01-22. ^ "Scarborough Subway Extension: Project Phases". www.scarboroughsubwayextension.ca. Retrieved 2018-10-20. ^ "Scarborough Subway Extension: Initial Business Case" (PDF). toronto.ca. June 2016. Retrieved June 21, 2018. ^ a b c d e f "2018–2022 TTC Corporate Plan" (PDF). Toronto Transit Commission. Retrieved July 2, 2018. ^ Moore, Oliver (January 29, 2016). "City proposes Queen Street route for Toronto's downtown relief line". The Globe and Mail. Retrieved 2017-01-22. ^ Vincent, Donovan (January 29, 2009). "City favours relief line over subway". Toronto Star. Retrieved 2009-01-29. ^ Spurr, Ben (June 2, 2016). "Yonge subway extension to York Region takes step forward". Toronto Star. Retrieved 2016-06-03. "Transit Toronto Subway Pages". Transit Toronto. Retrieved 2007-07-21. Bow, James (June 14, 2007). "Toronto's Lost Subway Stations". Transit Toronto. Retrieved 2007-07-21. "Thirty Years down the line". Toronto Star. March 1984. pp. M1, M9. "Rapid Transit Expansion Study (RTES)" (PDF). TTC. August 2001. Archived from the original (PDF) on 2006-04-19. "Rapid Transit Expansion Study (RTES) – Follow-Up Report" (PDF). TTC. June 12, 2002. Archived from the original (PDF) on 2006-02-21. "Spadina Subway Extension". TTC. 2011. Archived from the original on 2010-07-24. Wikimedia Commons has media related to Toronto Subway/RT.